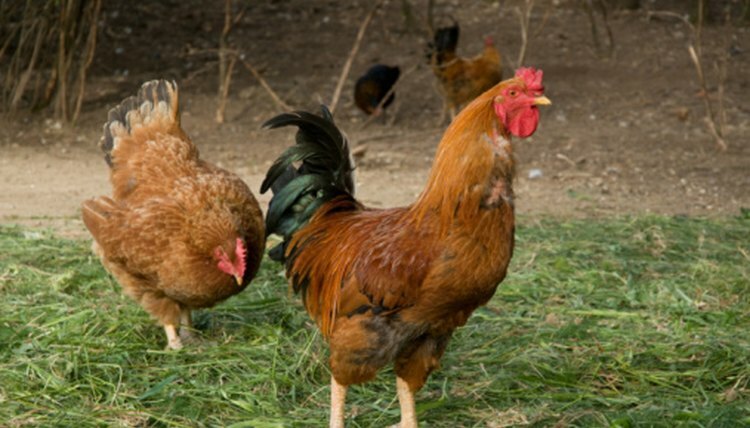 As chickens grow and reproduce, they often need a larger area to run and play. A chicken run is a fenced-in area attached to the chicken coop that provides more room for chickens to live. Chicken runs can be any shape or size you need. Assembly of a 10-by-10-foot chicken run is described here. The size can be scaled up or down to meet your needs. A PVC chicken run is light enough for two people to move from place to place. Lay out eight of the 5-foot long pipes in a square pattern with two 5-foot pipes on each side of the square. Place a 3-way corner connector on each corner of the square with the vertical port (the port not in the “V” shape) pointing upward. Place T-joints in between the pipes of each side with the vertical port pointing upward. Connect the laid out pipes together with the connectors and joints. This is the base of the chicken run. Insert the 4-foot pipes into the open vertical ports on the base. Tap the tops of the pipes with a rubber mallet to press the pipes into the connectors and joints. Place 3-way corner connectors and T-joints on the top of the vertical pipes. Match the connectors and joints with the corresponding connectors and T-joints on the base. For example, if the 4-foot pipe is in the vertical port on a T-joint on the base, the top of the pipe is inserted into the vertical port on a T-joint on the top. Connect the connectors and joints together with the other 5-foot pipes. This is the basic frame of the chicken run. Attach one end of the plastic fencing to one of the vertical bars on the frame with zip ties. Roll the fencing around the frame and attach it to each vertical PVC pipe. When the fencing has reached the first bar, attach it to the pipe and cut off all leftover fencing with scissors or wire cutters. Attach the fencing to the top and bottom horizontal bars in the same fashion as the vertical bars. Move the run next to the chicken coop. If there is not a door on the side of the coop, cut a 3-by-3-foot door in the side of the coop for the chickens to access the run. Add hinges and a lock to the door to restrict access to the run. Place the hinges 2 inches from each edge of the door along the top and screw one side of the hinge into the door. Place the door over the hole and screw the other side of the hinges to the side of the coop. The lock can be attached on the side or bottom of the door. Line the lock up on the door and the coop and use the screws that came with the lock to attach it. Clamp the pipe wall mounts to the vertical or horizontal pipes and screw the wall mounts to the side of the coop. All coops are different shapes and sizes. Use your discretion when attaching the run. Normally four mounts hold the run steady. Cut the section of fencing in front of the coop door. Cut a slit in the plastic fencing and bend the section upward. Use a zip tie to attach the flap to the fence at the top. This allows the flap to be reattached if the run is moved. Attach the ends of the bird netting to the top of one side of the frame and stretch the netting across run. Cover the entire top with the netting and attach it securely to the side of the frame with T-straps.